This post is the 100th post on Pepper's Paws!! I need to celebrate these 2 momentous occasions. I get to eat a pupcake! Mom bought it at 3 Dogs & a Chick! It is so pretty, and yummy!! OOOOOO!!! I have presents to open! 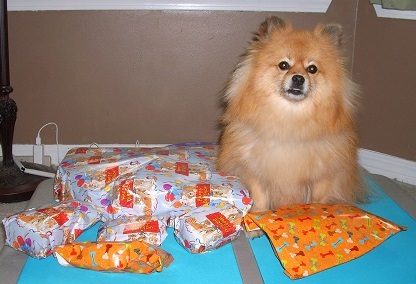 I open my own presents, probably because I know that Mom hides treats inside the paper. Mom has always used regular gift wrap, she didn't think about the chemical dyes. This year at Global Pet Expo, we found a gift wrap made specially for pets who open their own presents. When Mom told them that I would have my fifth birthday in a few weeks, Pet Party Printz gave us a sheet of their special gift wrap to use on my birthday presents! Some of them were already wrapped before we went to Global Pet Expo. Mom used the Pet Party Printz paper on the ones that weren't already wrapped. Pet Party Printz uses soy-based non-toxic inks. 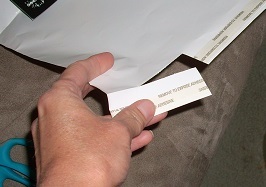 There is a perforated strip on one side that is self-adhesive. Humans use this strip instead of tape. Compared to plastic tape, the adhesive paper is less of a choking hazard. Naturally, my health and safety are Mom's first priority. Pet Party Printz is available in several patterns, and is sold in packs containing one folded 7 square foot sheet. It is an environmentally responsible (FSC) certified product, which is made in the USA. 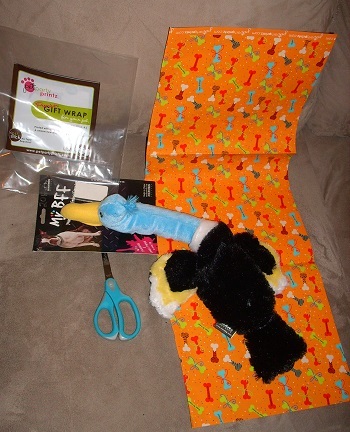 Mom says she might buy some Pet Party Printz gift wrap for my Christmas presents. My "big" present this year is The Company of Animals Green Slow Feeder. Green won Best in Show for the dog category of new products at Global Pet Expo 2013. It also won a Becker's Best award at Global Pet Expo. 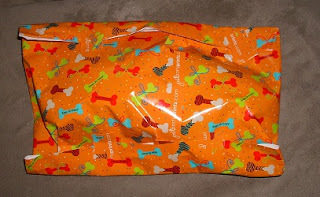 Mom had already purchased and wrapped mine before we went to Global Pet Expo. Since she picked a winner, I guess Mom is pretty good at choosing presents for me. BOL!! I think the visit to Baron's house was another present. For our supper, his mom cooked little burgers made of ground chicken! 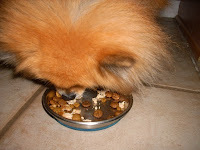 She broke them into bites, and mixed them with our Nutro kibbles. Thank you for celebrating my 5th birthday, and 100th post with me today! Hugs! Happy 5th Birthday, Pepper. It looks like you had a great time. What a super birthday you had! We thinks we would like one of those green foraging thingies! 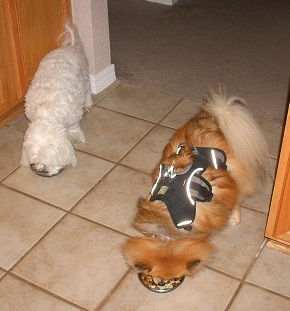 We loves our Stimulo Feeder but Disco's on a diet again so we are getting much kibble these days! And we like the thought of munchable wrapping paper, too! I bet you would have fun playing with food in the Green! BOL!! I don't usually eat paper, but I do get it pretty slobbery when I am trying to open presents! That looks like one fun time you had Pepper. 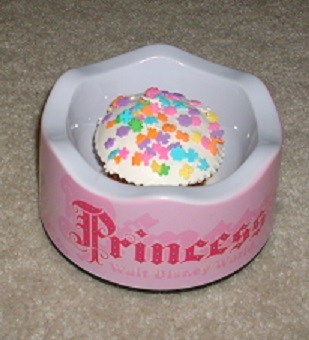 Maybe you and I will have to have a celebratory 5th birthday cupcake at BlogPaws when we go there. We'll have to make plans to meet! Happy Birthday sweetie, and enjoy the cool presents. Don't tell Mommy about that green food eater thing, that slows dogs down. I've got a record going on how fast I can eat my 1/8 cup at a time, and I'm not about to be slowed down, BOL!! We will have fun at BlogPaws! BOL!! Cover your mom's eyes so she doesn't see the Green. BOL! Happy Barkday Pepper! Luna has been wanting a Green Pet Feeder too! So glad you got one. It makes meal time more exciting (not that food already isn't exciting!) We had no idea about the dyes in the paper. Thanks for sharing! Thank you! The Green is pawsome! Happy birthday pep!!! Doggie friendly wrapping paper is brilliant! That slow eater, is it for treats or a meal? Tulip wolfs down her food! Thank you! 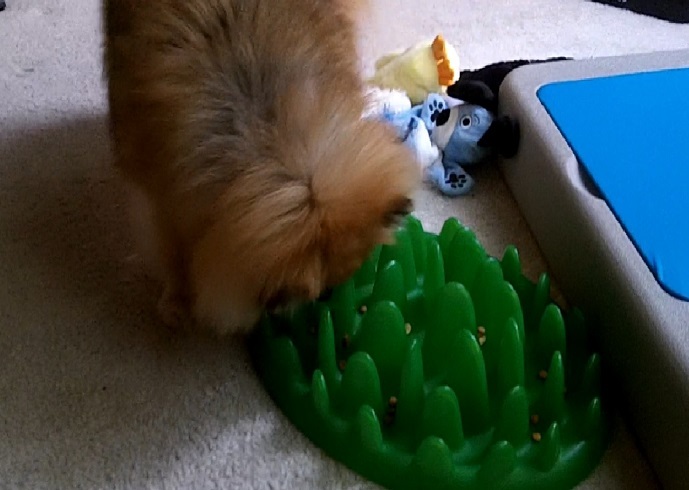 The Green is mainly for meals, but you can put treats in it too. Mom put treats at first, so I would learn, now it is kibble in it. I am glad you had a Very Happy Barkday, Pepper, and congrats on your 100th post! I love the idea of the pet friendly wrapping paper, since I love to shred and Mom is always worried about chemicals and dyes in products. Thank you! BOL!! This paper would be pawfect for a pup like you! Happy Barkday, Pepper!! My mommy got some of that wrapping paper fur us, too! Pawsonally, I think it's just as much fun as the stuff inside! BOL!! Thank you! 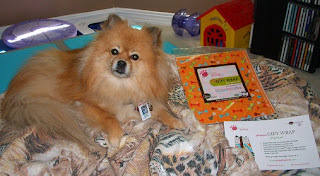 That is pawsome that you have some Pet Party Printz! I agree, it is just as fun as the stuff inside! BOL! Woohoo Happy Birthday sweetie. That's quite a lot to celebrate - your 5th birthday and 100 bloggy posts. Grabbing Pepper by the paws and doing the Happy Dance! Thank you Mario! Happy wiggle dance! Happy Happy Birthday!! A 5th birthday is soooooooo special! Your cake looked delicious! Enjoy! Happy Belated Birthday Pepper! Looks like you had a great time. 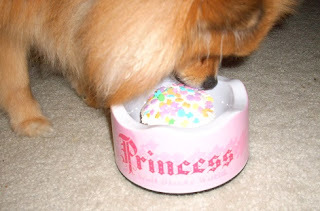 We love Pet Party Printz! Happy belated barkday, Pep! Looks like you had the best one yet! Miss ya, sweet buddy!